In this scene, Rosamaria and Origano have taken Basil to find treasure the “pirates” have hidden on a nearby island. 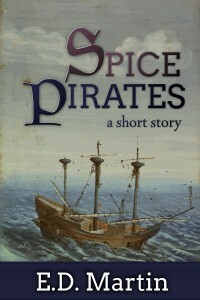 Last week, they found someone else on the island with them, who may just be actual pirates. Hands bound behind their backs, Origano, Rosamaria, and Basil were led through the dark to a small cove where men were busy loading crates onto a small ship. “What are you going to do with us?” Origano asked. He’d intended his voice to sound strong and brave, but to his ears it came across as pitiful, especially in contrast to the captain’s. He hoped Rosamaria didn’t notice. Also, my short story “Tim and Sara” is free this weekend, so head over to Amazon and pick up a copy. I love the way you used spice names for your characters. So very cute… and yet it sets up the “real” pirates as being all the more dangerous. Uh, well that’s what pirates do, right? He asked for it and now what happens. Someone has to rescue them, or what. Tune in next week. UH oh, this pirate captain isn’t kidding around, is he? Pretty dire straits for our heroes, hope they manage to escape before the ship sails! Interesting excerpt and cliffhanger. Oh oh, looks like the adventure didn’t quite turn out as planned;).